It's only been 4 days since this session happened and I have been beyond excited to share these photos! There is some serious beauty going on here, and I don't just mean in our beautiful mama to be. I started talking to Angela over Facebook when she asked for maternity photographers in a local group. This was Sunday, and I knew I was being induced on Saturday. It was a long shot. But I offered my services and threw my name in the hat. We started talking about a schedule and realized that we didn't have many options. Again, this was Sunday. The forecast called for rain on Tuesday, Wednesday, and Thursday, and Angela and Brad were unavailable on Monday. I threw out the idea of a session in the rain and crossed my fingers. Angela loved the idea! She explained to me that they had a couple of losses in their journey to parenthood and that the idea of shooting in the rain would be perfect. I was immediately touched and knew that this was meant to be. It came together so quickly, so perfectly, in just two days. And the session was beautiful. I had never shot in the rain before, and Angela and Brad were patient and understanding as I took a little more time getting my settings right, figuring out how to work with my camera while it was in a plastic bag to protect it. The most important thing is that we had fun. We were wet, kind of cold, but we laughed. And that's always the best! I loved getting to know Brad and Angela, their story, their heartache and their joys. There can be a lot of ups and downs as a couple goes through pregnancy, or multiple pregnancies. I'm once again humbled and honored that they chose me to capture such an intimate moment as they reflected on what the upcoming arrival of their baby girl means to them. 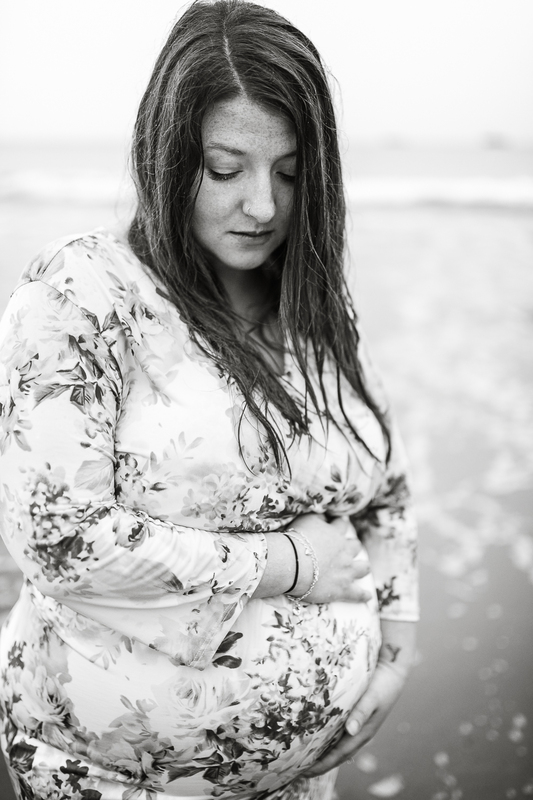 I really feel Angela's love for their baby in these photos, and marvel at her beauty and strength to be vulnerable enough to show me through my lens. Thank you for allowing me to be a part of this. And I can't wait to hear that your rainbow baby is here safely in your arms.